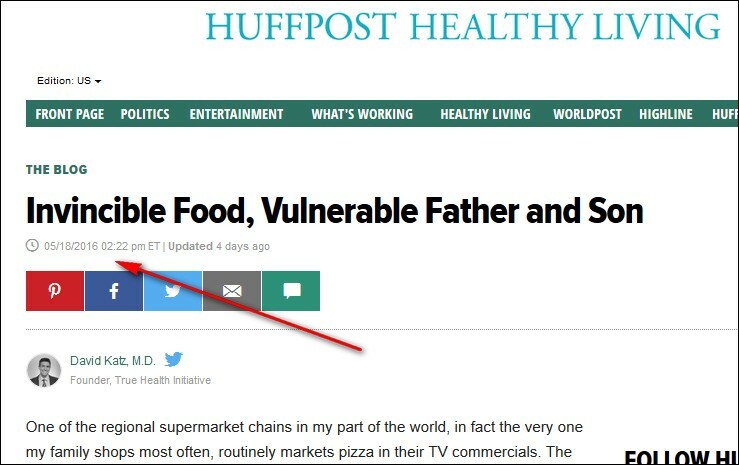 After I broke the story last September, the Huffington Post deleted two columns by David L. Katz MD in which he'd lavishly praised a fantasy novel called reVision. The problem was that Dr. Katz failed to disclose to readers that he wrote the book under a pseudonym. 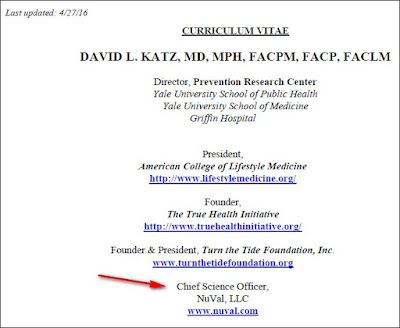 A recent column by Dr. Katz -- whose website describes him as "an internationally renowned authority on nutrition, weight control, and the prevention of chronic disease" -- raises new disclosure questions. 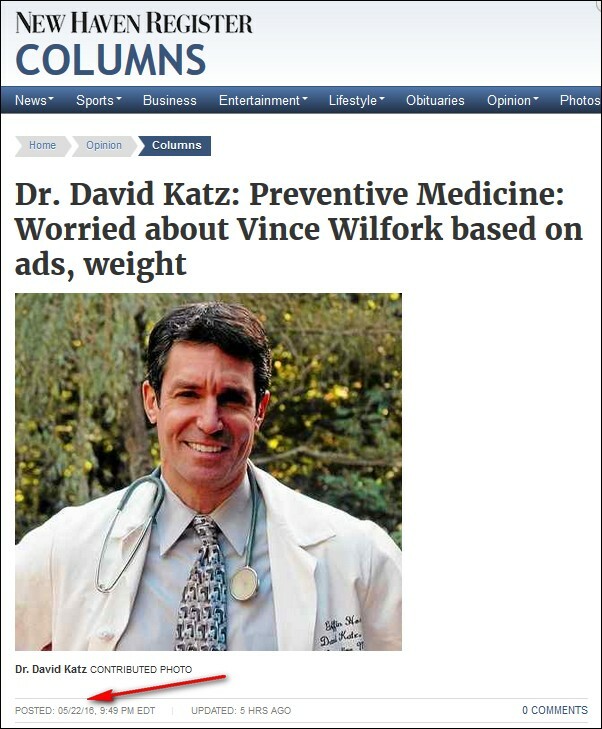 Published last week in the Huffington Post and yesterday in the New Haven Register, Dr. Katz tore into NFL star Vince Wilfork, diagnosing him as "severely obese," suggesting that his health may be "a ticking bomb," and even criticizing his parenting skills. The focus of the brutal critique was a giant-size pizza and sandwich named after the giant-size defensive tackle, and sold by Big Y, a New England supermarket chain which has a high-profile marketing campaign built around Wilfork's namesake "In-Vince-ible" menu. 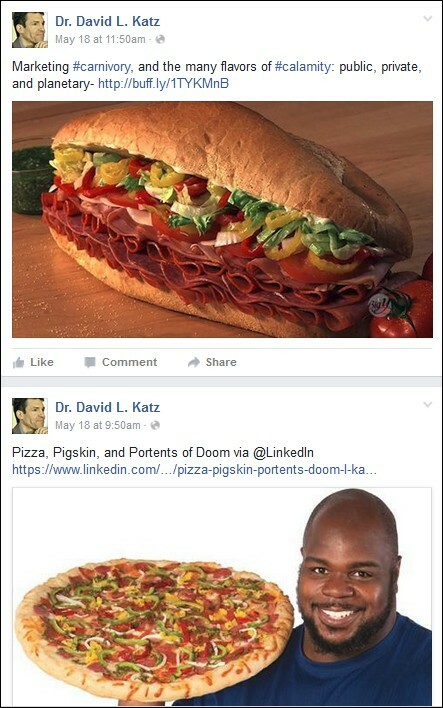 What Dr. Katz's column doesn't mention is that since 2010 he's had a business relationship with Big Y. This particular pizza, and the marketing campaign in which it figures, are both noteworthy in a variety of deeply disturbing ways for anyone who has heard the rumors about the state of either public health (i.e., epidemic obesity, epidemic diabetes, etc. ), or the planet (i.e., climate change, water shortages, habitat destruction, etc.). You see, it is not just any pizza. The sandwich features a pound of meat, comprising ham, pepperoni, hard salami, and capicola ham. The pedigree of the meats in question is not provided, but given the prevailing norms, one presumes that both cattle and pigs were harmed in the making of this meal. ...Where the likes of this pizza and sandwich...are introduced, health is devastated, and in short order. ...And all of this says nothing about the environmental costs of that pizza and sandwich. Providing no indication that he examined Wilfork or consulted his physician, Dr. Katz diagnoses Wilfork as "severely obese" and adds, "I very much suspect his health is a ticking bomb, and retirement will markedly trim the fuse." Studies show that the “eyeball test” differentiates fat from muscle nearly as well as fancy measures of body composition. Meaning no disrespect whatever to Vince, an especially perspicacious eyeball is not required to see that his health is in peril. There are plenty of images on-line; search them and see for yourself. According to this screenshot from Dr. Katz's website bio, his writing attracts plenty of eyeballs -- perspicacious or otherwise. In multiple tweets and Facebook posts, he steered his many social media followers to the column. Here's what Dr. Katz's column didn't tell readers. (Dr. David) Katz was at the Big Y store in Ansonia Friday to help promote the store's implementation of NuVal, an index that ranks food items from 1 to 100, with a higher ranking signifying a healthier food. More than 30 nutrients and nutrition factors are taken into account in the ranking. 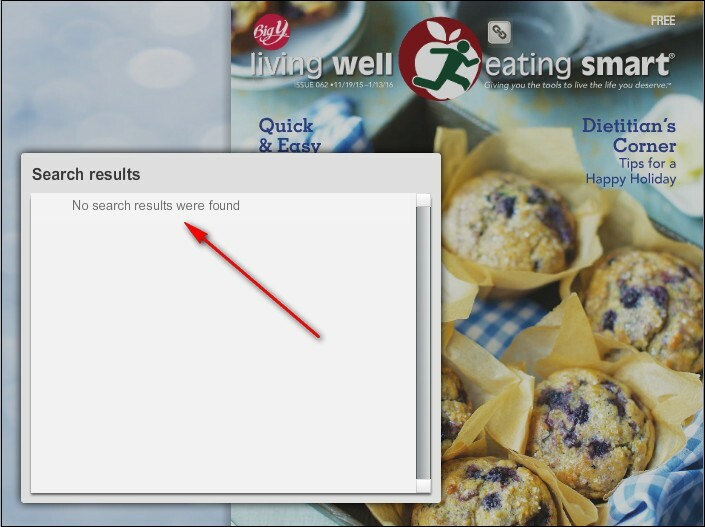 The system, which Katz helped create a few years ago, takes the guesswork out of healthy eating. 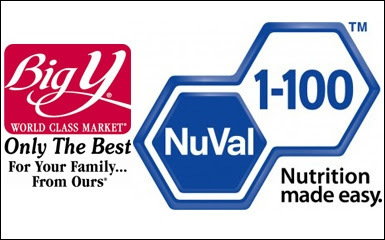 NuVal is a collaboration between Griffin Hospital in Derby and Topco Associates, an Illinois-based food industry cooperative whose members include Big Y. On Sept. 9, Massachusetts-based Big Y became the latest chain to adopt the system. 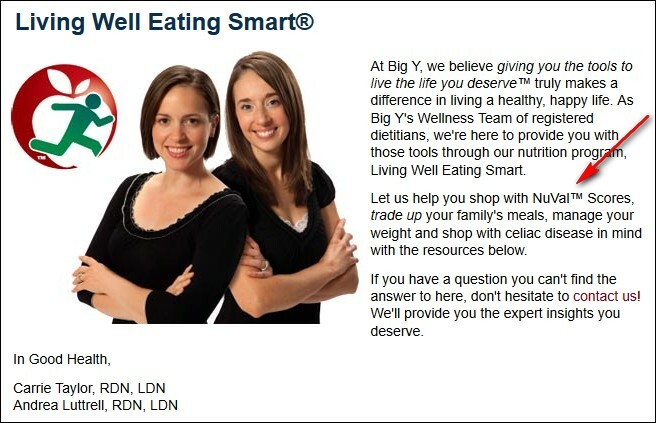 The program fits in perfectly with the chain's nutrition program "Living Well Eating Smart," said Big Y dietician Carrie Taylor during a Friday press conference at the Ansonia store. ...Most people don't have time to thoroughly examine the nutritional labels on every item they buy and assess which choices are the healthiest, Katz said. Thus, they're susceptible to misleading packaging that touts a product as "reduced fat" or "low sugar." "If you try to improve health one nutrient at a time, you're probably going to get duped by Madison Avenue," Katz said. 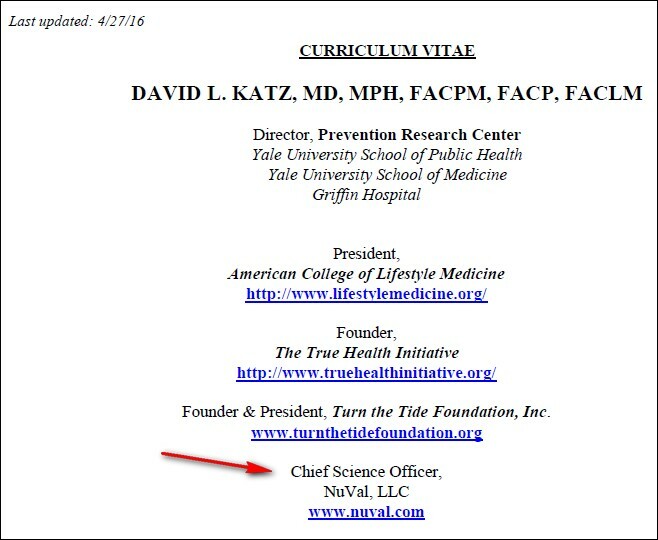 Should Dr. Katz have disclosed NuVal's partnership with Big Y? Presumably that determination falls to the Huffington Post and the New Haven Register. Does Big Y continue to use the NuVal system? And what's the company's response to Dr. Katz's allegations about their In-Vince-Ible menu? Last week in mulitple e-mails and phone messages, I posed those questions to Claire D'Amour-Daley, Big Y's Vice President Corporate Communications. I haven't received a response. Here's some interesting information I did manage to find. 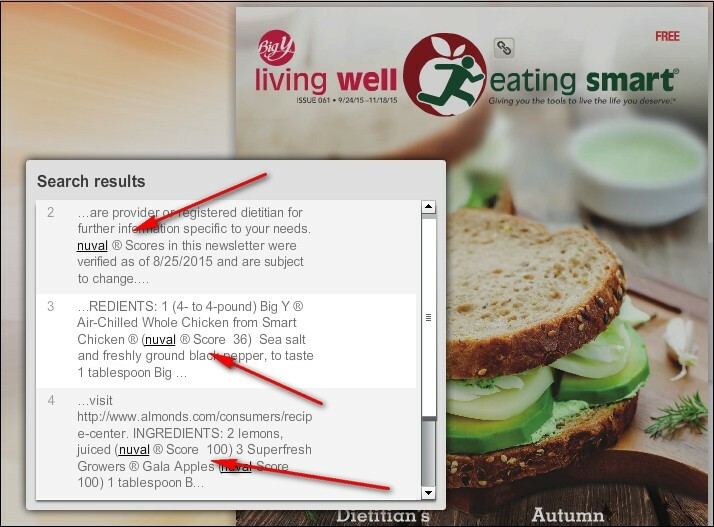 Click here for the 2015 issues of Big Y's free in-house newsletter Living Well Eating Smart newsletters. But an identical keyword search of the next issue (November 2015) and every subsequent issue posted on Big Y's site failed to produce any hits. 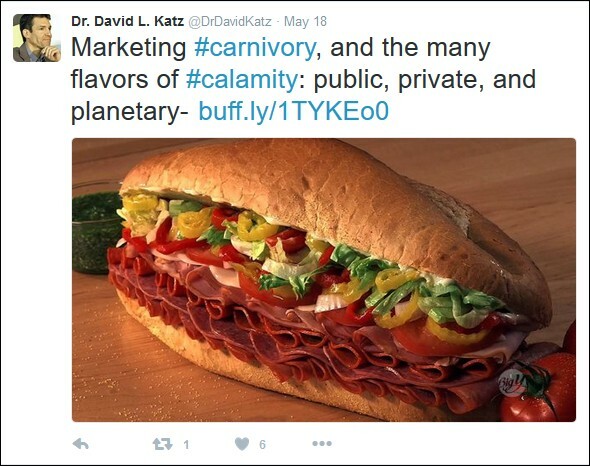 If Big Y is still a NuVal client, whether or not you agree with his conclusions, Dr. Katz should be commended for disregarding financial repercussions and speaking his mind about what he considers to be the public health and environmental dangers posed by the ginormous pizza and sandwich. 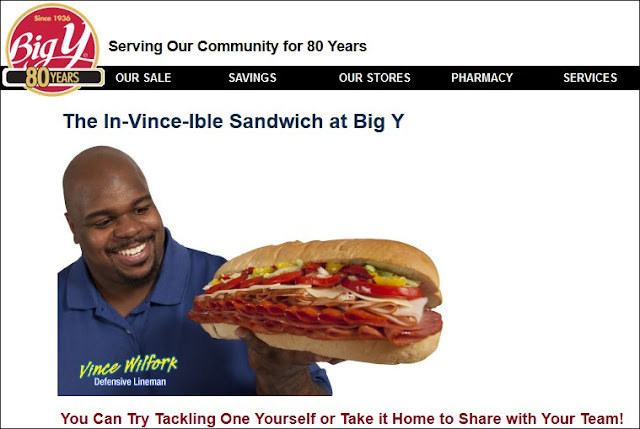 On the other hand, if Big Y is no longer a NuVal client, it appears that Dr. Katz bit the hand that used to feed him.